If you are reading this, then you have graduated with your degree and are considering contracting with an LPC supervisor. Congratulations on your achievement! I am writing this to orient you to some important things you may want to know for your consideration. I want you to know, up front, how I approach the supervisory relationship, what my background is, and what kinds of things you may expect if we enter into a supervisor/supervisee relationship. My degree is in Marriage and Family Therapy, so I am systems oriented. I utilize brief, positive, solution-focused interventions. It is sometimes difficult to discuss my approach in more specific terms, because that would limit and inadequately describe what happens in counseling. I believe it is the job of the therapist to adapt their approach to each individual or family so that the methods will be taken in most effectively by the client. I often employ RET and Reality therapy techniques. I also like Existentialism and Milton Erickson. I am a Certified Diplomate in Clinical Hypnotherapy, so I work with clients who have traumas or fears. Also, I help people lose weight and stop smoking and aid them with any other concern that can be eased with hypnosis, and most can. I endeavor to enable them to frame perceptions in a way that the subconscious mind more readily accepts. That helps them to move forward automatically and with less conscious effort. NLP, as it relates to hypnotherapy, is without a doubt one of the most effective techniques I have ever learned. I find myself getting more active over the years and my belief is that clients come to see therapists because they don’t know what to do. What has happened for most is that they have kept doing more of what they did before and things have gotten worse. I think most clients are stuck in tunnel vision thinking choices are limited and they need help getting unstuck. One real truth is that perception is subjective. It is up to us to help clients broaden their perspectives and expand their choices. When they can look at things differently, they can see ways to take action to feel better about themselves and their world. 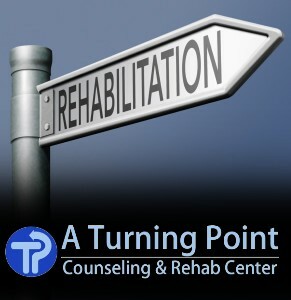 At Turning Point, in addition to marriage and family counseling, we offer substance abuse intensive outpatient recovery programs for adults who are struggling with chemical dependency or other addictive behaviors. That means we employ peer and multi-family groups over a period of weeks to help people get and stay sober. We also work with dual diagnosis clients; which means we help them take a look at improving other emotional issues which are in some ways connected to the addictive behaviors. Also, as mentioned previously, my wife, Donna, and I also use Hypnotherapy to address a variety of situations. There are a few other therapists on staff who see clients or facilitate groups in our programs on a part-time basis. I am committed to providing the most effective and highest quality of supervision. Some documentation of cases is required for organizational and liability purposes. There will be entry and discharge notes as well as brief session case notes for the purposes of our discussion and also to help you to get an effective note-writing style. I will also ask you to make videos of sessions at times and review them for purposes of learning and improving your awareness of yourself and the way in which you come across to your clients. You may be surprised at how educational watching yourself on video can be. It will be one of the most valuable learning tools you will ever encounter. Any and all subjects related to the mental health field will be open topics for discussion during our meetings. I am knowledgeable about most aspects of private practice and also familiar with working for agencies, since I have done both. Managed care and insurance filing issues are all topics with which I am only too familiar. Also, I have learned through experience and of necessity, not through any graduate courses, about how to market services in the mental health field. That discussion may be of value to you and marketing methods seem to be in a continual cycle of development, modification, and improvement. At times in the past, I have presented at conferences symposiums. It may be of interest to you to talk about how to gather information and present it in interesting ways. First, join with your client and be accepting so that they gain a level of comfort and hope when they are with you. Always be positive and encouraging. Find things they have done that were positive and tell them about it. Clearly define goals. Imply that they have already started their path to improvement and it is inevitable that they will continue to get better. Always be thinking of ways to help. Try things based on your ideas. Be proactive. You are their advocate and often the only person they can confide in. You will not need to prepare things before sessions. Clients will come in with plenty of stuff to talk about. Trust me on this. Don’t ask too many curiosity questions. Clients will usually tell you what they need for you to know. Respect their ability to move forward. Honor the fact that they already have all the tools they need for growth. You are only there to help them discover that fact. I subscribe to a developmental model of supervision, meaning I don’t expect you to know a lot in the beginning, but as you accumulate experience, I will encourage you to apply the knowledge gained in your work. I hope to make the experience an enlightening and challenging one. I will probably supply more information for you in the early stages of our contact and be asking more questions of you and allowing you to do some investigative thinking as we go along further. I believe in the importance of humor and you may have to be somewhat tolerant of that, but hopefully, my jokes won’t be too corny. I will endeavor to be fair and open with you as I hope you will be with me. At times, I may offer constructive criticisms, but I am assuming you will want to hear them and use them to grow. For the most part, I see myself as supportive, positive, and encouraging. I am open to your feedback as well for none of us ever stops learning. If you decide to walk down this road with me, I hope we will develop a trusting, comfortable relationship that will be mutually beneficial for both of us. Just as it is important for clients to find their unique path, you, as their therapist will develop an individual style of your own over time. I want to honor that journey for you. I hope I will be an example for you, but not impose my approach on you. Take what you experience, add to it, and transform it into something you can call your own. It is a new and exciting opportunity you are beginning. I wish you only the best. I know you will find this career to be fulfilling in many ways. Good Luck!